The Cuisinox Gourmet rondeau pan is made from high quality 18/10 stainless steel and features a two-toned satin and mirror finish with a 3-ply clad base, guaranteeing superior quality. The rondeau pot is a favorite among restaurant chefs as it is wide and low, allowing for easy browning and poaching both fish and meats. 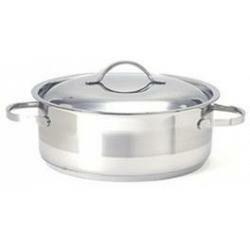 The rondeau pan has a capacity of 7L / 8qt, has a diameter of 30cm / 12", and has a height of 10.5cm / 4.25". The rondeau pan features graduated interior markings for your convenience, is induction ready, dishwasher safe, and has a 25 year warranty.